This CellML version of the model has been checked in COR and OpenCell and the model runs to replicate the results in the original published paper. The units have been checked and are consistent. ABSTRACT: Many organisms display rhythms of physiology and behavior that are entrained to the 24-h cycle of light and darkness prevailing on Earth. Under constant conditions of illumination and temperature, these internal biological rhythms persist with a period close to 1 day ("circadian"), but it is usually not exactly 24 h. Recent discoveries have uncovered stunning similarities among the molecular circuitries of circadian clocks in mice, fruit flies, and bread molds. A consensus picture is coming into focus around two proteins (called PER and TIM in fruit flies), which dimerize and then inhibit transcription of their own genes. Although this picture seems to confirm a venerable model of circadian rhythms based on time-delayed negative feedback, we suggest that just as crucial to the circadian oscillator is a positive feedback loop based on stabilization of PER upon dimerization. These ideas can be expressed in simple mathematical form (phase plane portraits), and the model accounts naturally for several hallmarks of circadian rhythms, including temperature compensation and the per(L) mutant phenotype. In addition, the model suggests how an endogenous circadian oscillator could have evolved from a more primitive, light-activated switch. 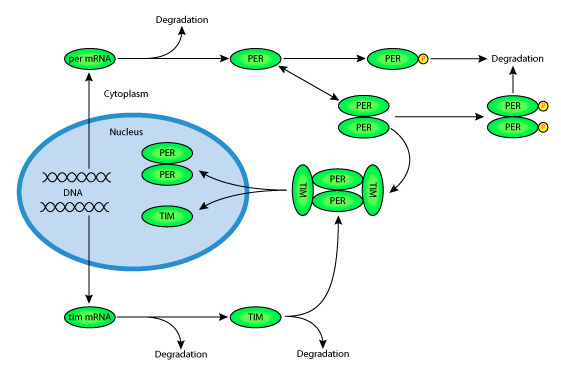 Schematic diagram of a simple molecular mechanism for the circadian clock in Drosophila PER and TIM proteins are synthesised in the cytoplasm where they may either be degraded by proteolysis or alternatively they may combine to form relatively stable heterodimers. These complexes are then transported to the nucleus where they act to inhibit the transcription of per and tim mRNA. Derived from workspace Tyson, Hong, Thron, Novak, 1999 at changeset 58622087b224.